A complete overview of the evolving organization, tactics, doctrine, weapons and equipment of the US Infantry in the Pacific, Mediterranean and European theatres, from 1944 to the war's end. 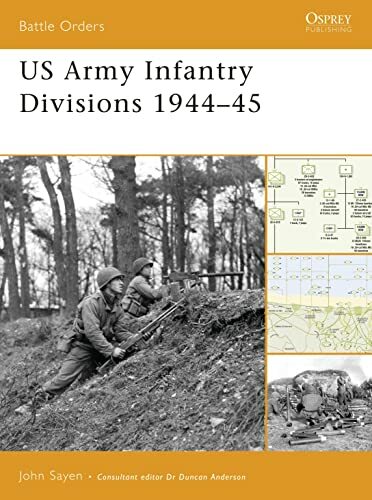 This follow-up to Battle Orders 17: US Army Infantry Divisions 1942-43, covers the critical period 1944-45 when changes instituted by Lieutenant General Leslie J McNair, the head of the Army Ground Forces and an organizational genius, were imposed on an army reluctant to change. The book includes a table outlining all 66 US Infantry Army divisions that served during World War II, and analyzes the organization of manpower and resources that turned these divisions into a war-winning army. John J. Sayen Jr. retired in August 2002 from 30 years active and reserve service with the United States Marine Corps. During that time he served with artillery, armor and military intelligence. He is presently engaged as a contract civilian analyst for the Marine Corps. He graduated from the Citadel in 1974. He has previously published a military-historical magazine, The Tactical Notebook, and for Osprey has written Battle Orders 17: US Army Infantry Divisions 1942-43.